Briya’s family literacy students, who come from nearly 40 different countries, recently celebrated their many cultures during parenting class and PACT time. Students shared their countries’ food, objects, music and clothing—arroz con leche from Mexico, an outfit from Myanmar, a model of a pyramid from Egypt, a dance from El Salvador and much more. 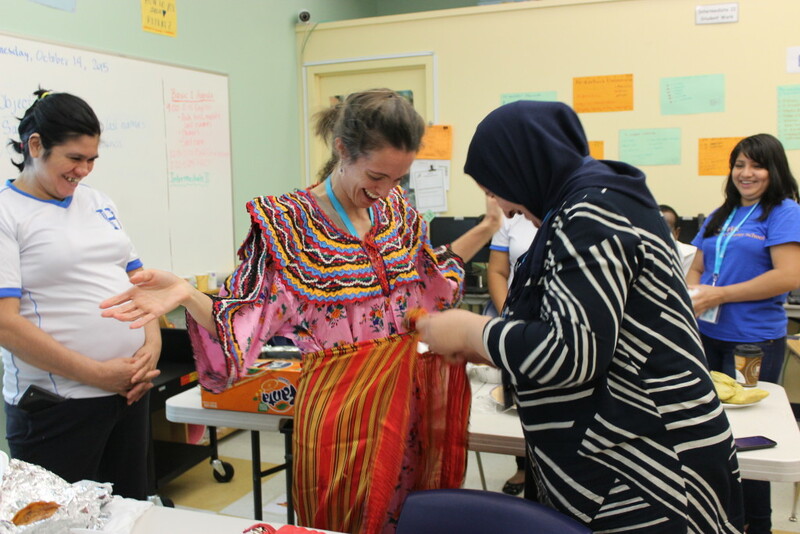 In parenting class, students learned about the benefits of sharing their cultures with their children. When listening to stories, children pick up new vocabulary, sounds and language patterns. Telling family stories is a great way for families to bond and for parents to pass on their values and traditions. And studies show that children who know their family history, especially stories of overcoming difficulties and hardship, are better able to overcome challenges they face in their own lives. As they listened, watched, tasted and talked, students reflected on the importance of sharing with their children, felt pride in their own traditions, and gained understanding of their classmates’ diverse backgrounds. Students went home with a renewed sense of belonging at school and a reminder of a wonderful way they can strengthen their families. Some of Briya’s smallest students stepped up to advocate for the importance of their education this fall. Briya PreK students and their parents gathered on the grounds of the US Capitol to raise awareness of the benefits of early education during the Miles Ahead for Early Learning rally. Children had a blast running in a relay race to remind policymakers that children get miles ahead when they have high-quality early learning opportunities. US senators, representatives and education leaders then spoke about the value of investing in early education and childcare for all children. The rally was organized by Moms Rising, an organization that advocates for issues facing mothers and families nationwide. Manuche Gonclaves, a student in Briya’s Advanced II family literacy class, is committed to her education in spite of obstacles that she faces as a student, parent and immigrant. Gonclaves advocated for adult learners like herself in a letter to 4th Ward councilmember Brandon Todd, which won first place in the English Language Learner category of the Adult Education and Family Literacy (AEFL) Week essay contest. Essay contest entrants were prompted to write a letter to their councilmember explaining some of the obstacles they face in pursuing their education, taking care of their family, and/or getting or keeping a good job, and to propose ways for the council to address these issues. Gonclaves, who came to the US from Brazil five years ago, has two daughters, one of whom is in Briya’s toddler class. She is working to earn her high school diploma through Briya’s National External Diploma Program and then plans to graduate from the school’s Medical Assistant Program. In her letter, Gonclaves explained difficulties that she and other adult learners face in her letter. Gonclaves proposed increasing free or inexpensive daycare options and having more college scholarship opportunities so parents can afford to get further education. Gonclaves was honored at an event kicking off Adult Education and Family Literacy (AEFL) Week at Busboys and Poets on September 21, where she read her letter and received a prize. Read Gonclaves’ full letter here.